A very common scenario when using RadScheduleView is the usage of custom appointments. When you create a Custom Appointment class you gain the ability to append additional properties to the base Appointment class, to add them to your custom AppointmentItem and optionally to its ToolTip, display them in the EditAppointment dialog while supporting the cancelation of editing. To create a custom appointment class you can start off with either of the following approaches : you can implement the IAppointment interface or you can inherit from one of the classes that already implement this interface – AppointmentBase (the base implementation of the interface) or Appointment (an extended implementation). It is very important to provide your own implementations for the Copy and CopyFrom methods as they are used intensively in the editing process of the ScheduleView control. If you choose to implement the interface, the Copy and CopyFrom methods will be automatically implemented for you, but if you take the second approach and inherit from one of the base classes, you should keep this in mind. When inheriting the AppointmentBase class it is required to create a parameter-less constructor for the the custom class. For the next step, it is important to set the AppointmentsSource of RadScheduleView to be of type IList, because this way the ScheduleView knows that our custom appointments should be of type Task. Example 2 demonstrates how to create an ObservableCollection. In order to create a custom appointment dialog we are going to modify the EditAppointmentDialogStyle property of RadScheduleView control. 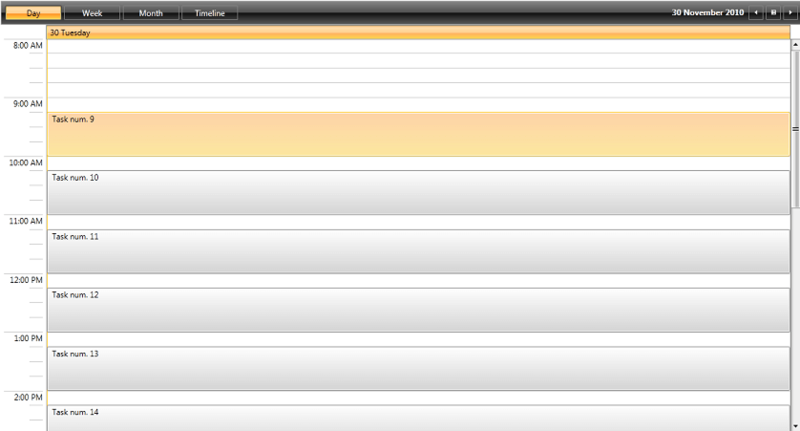 The DataContext of the SchedulerDialog, which is the TargetType of this style is an AppointmentDialogViewModel object. This class contains all needed data for editing an appointment including the Appointment itself. It can be reached by using the Occurrence property of the ViewModel and subsequently the Appointment property of Occurrence. Now that we have our custom IsDone property, let's add a CheckBox for it and bind to it. In order to do that, you need to extract and modify the default ControlTemplate of the EditAppointmentDialog with x:Key="EditAppointmentTemplate". You can locate it in the "Themes.Implicit\"your theme"\Themes\" directory inside the UI for WPF installation folder. The template along with the style through which it can be applied with x:Key="EditAppointmentDialogStyle", can be found in the "Telerik.Windows.Controls.ScheduleView.xaml" file. For more information about extracting and modifying the dialog ControlTemplates, check out the How to extract the default styles of the dialogs section in our documentation. After you have extracted the default EditAppointmentTemplate, you can add a CheckBox as demonstrated in Example 3 which can replace the CheckBox with x:Name="AllDayEventCheckbox". The important thing to note here is that we can bind to our new properties using Occurrence.Appointment. Next, we are going to change the ControlTemplate of the AppointmentItem to reflect which tasks are done and which are not. We will do that by using the AppointmentStyleSelector property of the RadScheduleView. For more information on extracting and modifying the default style selector, check out the Appointment Style article. For the purposes of this example we will modify the ControlTemplate of the VerticalStyle property. The DataContext of the AppointmentItem's ControlTemplate represents an AppointmentProxy, which holds the most important properties of the Appointment and the Appointment itself. We want to display a green dot for all tasks that are done. We will achieve this by adding an Ellipse in the ControlTemplate and then binding its Visibility to the IsDone property of the Task through a converter. The Ellipse demonstrated in Example 4 is added to the ControlTemplate of the VerticalStyle. The ControlTemplate's key is "AppointmentItemVerticalControlTemplate". You can refer to the Editing Control Templates article for more information about extracting ControlTemplates. This step is, of course, optional. 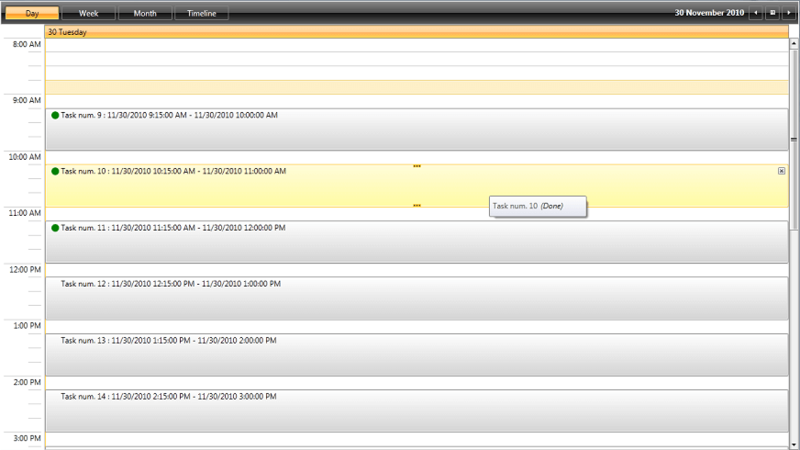 The customization of the Appointment ToolTip is achieved by setting the ToolTipTemplate property of RadScheduleView. The DataContext in this template is once again of type AppointmentProxy so we can use the same approach we used in the AppointmentItem ControlTemplate. By completing this last modification, we have reached the end of the process needed to create a custom appointment in RadScheduleView control.